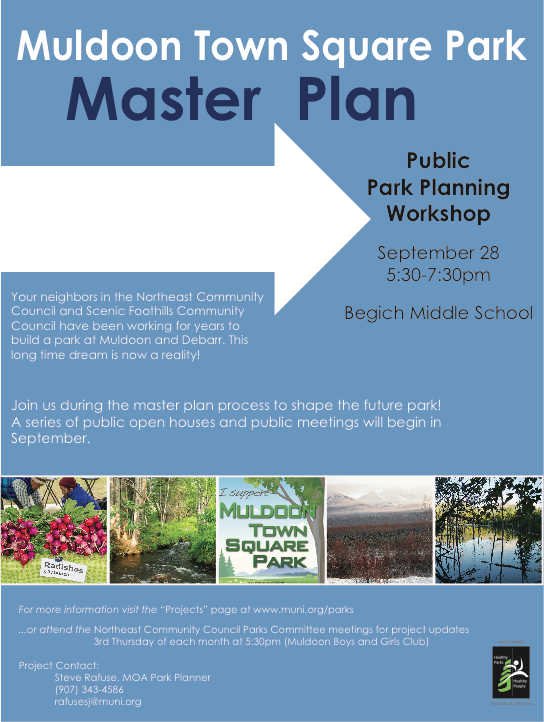 Muldoon Town Square Park Master Plan Public Planning Workshop 5:30 pm – 7:30 pm Monday, September 28, at Begich Middle School, 7440 Creekside Center Drive. Please come and help plan this new community park on the old Alaska Greenhouse site at DeBarr & Muldoon. This entry was posted in Muldoon Town Square Park and tagged 2015, community, master plan, park, planning, September, workshop. Bookmark the permalink.